The following is a short list, in no particular order, of some of my career highlights. Examining six of the original Archaeopteryx specimens, along with the original feather and Compsognathus, at the Paläontologisches Museum in Munich, Germany (October, 2009). Describing a giant prehistoric reptile the size of a blue whale: In 2018, working with colleagues, I led a study that described a giant ichthyosaur from the UK. This animal may have been up to 26 m long. It also led to the reidentification of several 'dinosaur bones' that are actually jaw bones of giant, unrecognised ichthyosaurs. The examination of an icon: In 2009, I was part of a small team who examined and compared six of the original Archaeopteryx specimens, plus the original feather and Compsognathus specimen, at the Paläontologische Museum in Munich, Germany. My first two books: Fossils of the Whitby coast & Dinosaurs of the British Isles. Both have received excellent reviews. The dinosaur book had been something I had long intended to do and, despite all of the setbacks, this mammoth-sized project was completed. The project included taking various trips across the British Isles (and USA), examining thousands of British dinosaur remains and corresponding with numerous palaeontologists across the globe. The book will no doubt inspire future palaeontologists. The discovery of a new fossil site in Doncaster: Doncaster is famous for its mining history whereby lots of fossils were unearthed from the Carboniferous Period. Unfortunately many of these fossils remained uncollected or documented. In 2012, along with a friend and colleague, I discovered a Lagerstätte site within Doncaster that has so far yielded fossil occurrences never before seen in the town (or the county), including the remains of sharks and horseshoe crabs. Fossil-rich areas in Doncaster are rare. 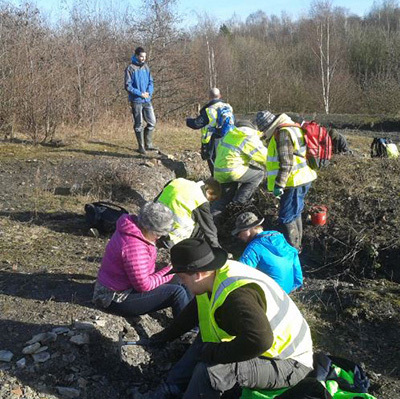 Leading a fossil hunting trip for UKAFH to the only active fossil site in Doncaster, which Dean co-discovered (Feb, 2015). Rediscovering the hidden palaeontology collection at Doncaster Museum: A collection of 12,000+ specimens had been hiding at Doncaster Museum for a very long time. The last palaeontologist at the museum died in 1912, and nobody had studied the collection in detail since. I recognised the importance (educational, local and scientific value) of the collection and, along with a colleague, secured funding to review it. The collection is now among the best in the museum and the fossils are fully accessible. For me, it is rewarding to see my hometown museum’s palaeontology collection revitalised and capable of inspiring future generations. ‘Plaster cast’ to new species named in honour of Mary Anning: In 2008, I rediscovered an ichthyosaur specimen held in the collections at Doncaster Museum and Art Gallery that was misidentified as a replica. Over the course of 5+ years of research, working with Prof. Judy Massare, we determined that it was a new species known to science and named it in honour of early fossil collector, Mary Anning (Ichthyosaurus anningae). The scientific study was published in early 2015. Winning a Gold Medal for excellence in science: As part of my research and science communication, in 2015 I presented my research on the new species of ichthyosaur as part of the Set for Britain 2015 event, held in the Houses of Parliament, London. Set for Britain is aimed at early career scientists who are passionate and enthusiastic about their subject area and who can communicate detailed, scientific research to an interested layperson. Taking part is an achievement, and getting to the final stage was a great accomplishment. Competing against 59 other early stage researchers, from various universities, I came first in the Biological and Biomedical Sciences competition winning the prestigious gold medal (G. J. Mendel Award) for excellence in science. The amazing 9.7 m (33 ft) long death track (mortichnia) of a fossil horseshoe crab (Mesolimulus walchi) collected from the Upper Jurassic Solnhofen limestones (Eichstátt) of Bavaria, Southern Germany. The world’s longest ‘death track’: One of my studies described the longest fossilised ‘death track’ (called a mortichnia) in the world. This mortichnia comprised a 9.7 m long trackway created by a horseshoe crab, with the animal preserved at the end. This Jurassic specimen was collected from the famous area of Eichstätt (Solnhofen), Germany. The study gained international media coverage. A lecture series at the age of 20: The first-ever lecture series I gave was for the Friends of Doncaster Museum. This well-attended, six part education course, focused on an introduction to palaeontology with an emphasis on dinosaurs and dinosaur contemporaries, culminating with a fossil hunting trip to the Whitby coast. It was a great success and opened my eyes to presenting and teaching. Visiting Scientist at The University of Manchester: Based on my professional experience and contribution to palaeontology I was offered (and accepted) the role as an Honorary Visiting Scientist in the School of Earth, Atmospheric and Environmental Sciences. Considering the approach I have taken into a career in the science, I consider this a huge achievement. 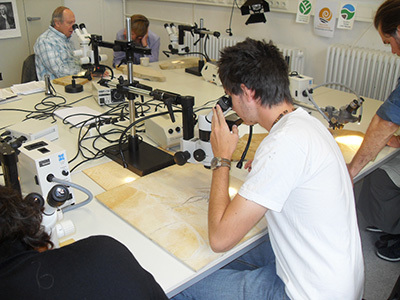 Mentoring students has also opened my eyes to other avenues in palaeontology. Dinosaur Britain – A two-part TV series: For a long time, I had the idea of a TV documentary about British dinosaurs. Working with the brilliant team at Maverick TV, we were able to make this a reality. The idea was based, in part, on my book Dinosaurs of the British Isles, and developed with Dan Goldsack (Maverick TV). It was great to work with the excellent Ellie Harrison. Ellie has a genuine interest in palaeontology and was super-excited about the project. I am very passionate about promoting British palaeontology, and to have millions of people watch Dinosaur Britain, an idea literally come to life, was truly incredible.